Following on from my post of some years ago now on the Express Footway some new archival footage has arisen of Sydney’s most atmospheric subterranean thoroughfare, back on its inaugural day. Master Jenson (aged 13 months) is not too sure what to make of it by the end, but 54 years later people are still going for footway joyrides. This blog’s author leading a tour of Sydney Mystery Structures along the Express Footway in October 2015. At first the tunnel seems bland, the kind of white-walled passage that might be found in a hospital, or underneath an office building. Then a noise arises, a mechanic hum with long, high shrieks. As I walk along the tunnel the noise gathers in intensity. I expect to soon discover the basement of the city, where huge machines churn, keeping the aboveground functioning. A sign points left: Domain Carpark, To Express Footway. Here the white walls end. A protruding fibreglass rock ledge marks the edge of a painted expanse of water and trees, a mural of Sydney harbour. I am about to experience the history of Sydney from colonial invasion to the present day in twenty paces. Above the ledge is painted a group of Aboriginal people holding spears. The man at the edge of the rock points to the tall ship which looms massively in the bright blue harbour water. The ship is roped to the Sydney Harbour Bridge, which it pulls along in its wake. Incarcerated behind the bridge, the huge, brooding face of an Aboriginal elder stares, his hands clasping the bars. The Bridge then morphs into the white sails of the Opera House, and beyond it continues the pristine harbour. A relief panel cut out of the wall shows the foreshore built up with high rises, a window into the harbour’s despoilment. The noise has intensified almost to the point of distraction and the source of it is now in view, the Express Footway. Two adjacent paths of smoothly moving black rubber tread stretch before me, one moving towards the Domain Carpark, the other away from it. Linking the carpark with Hyde Park, the footway runs for just over 200 metres at a pace slightly slower than that of walking. If you stand still and allow yourself to be conveyed, the journey takes five minutes. I step onto the footway. It is a weekday morning and neatly dressed people with armfuls of documents power past in both directions, on their way to or from important business. 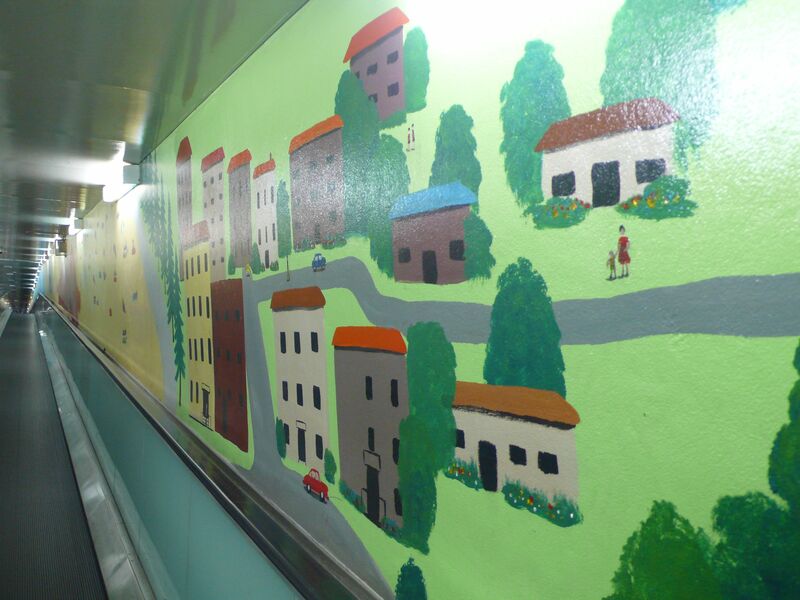 They pay little attention to the mural, which stretches the length of the footway on both sides. At the start of it are painted two oversized children leaning over bright green hills, pushing along a fire truck and an ambulance with giant hands. Beside them another large child holds up a spiky yellow orb, a substitute for the sun, which feels far away in this underground gloom. No matter the time of day or the weather outside the footway retains the same artificially lit ambience. It is a complete environment and I give no thought to what must lie above ground; the footway operates within its own atmosphere, with its own light, sound and scenery. 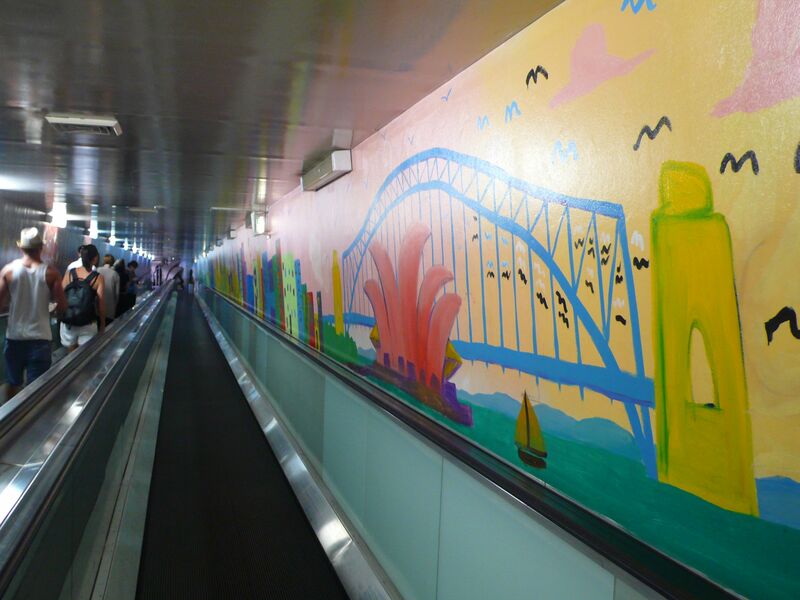 The versions of Sydney on either side of the footway are bright and painted in sloppy strokes. More Opera Houses appear, one salmon pink against a bright blue bridge, another indigo in a night cityscape, with wheels of stars above it. Then I am travelling through an ocean of lopsided sharks and turtles. The ocean swells into a frothy wave before it breaks over a long stretch of yellow sand. On the sand are dotted rainbow umbrellas and towels, with tiny sunbathers lying beside their beach bags and thongs. Max Dupain’s Sunbaker, here given the pink tinge of sunburn deprived of him in the silver gelatin original, appears huge in scale, Gulliver beside the Lilliputians of the beach scene. All the while the footway continues to hum and shriek. When I move to the side to let people pass, the edge of it shudders underfoot. In the late 1950s extensive networks of moving footways under Sydney streets were considered as a solution to one of the newest civic problems, traffic congestion. The Sydney of the time was obsessed with improvements. Most of the city’s trams had run their final journeys and the tracks been dug up and sealed over; the Cahill expressway was under construction. Everyone had an opinion on how to deal with the growing traffic problems. One popular proposal was for the demolition of the maligned Queen Victoria building and its replacement with a city square and vast underground carpark. Headlines such as “Only a Bomb Will Shift It” and “Tear Down This City Horror”, accompanied by the familiar image of what is now Sydney’s retail showpiece are surprising, even shocking to the contemporary eye. Sydney desperately wanted to move forward, and the Victorian architecture which is now so celebrated was considered by many to be irrelevant, a relic of a less sophisticated time. The new city was one of maximised efficiency: expressways, underground carparks and functional buildings. At the time of the footway’s construction in 1960 it was purported to be the longest moving footway in the world. It eliminated the steep walk up from the parking station to the city by cutting through underneath the Domain at an almost imperceptible incline. The footway was officially opened on Friday, June 9th, 1961. 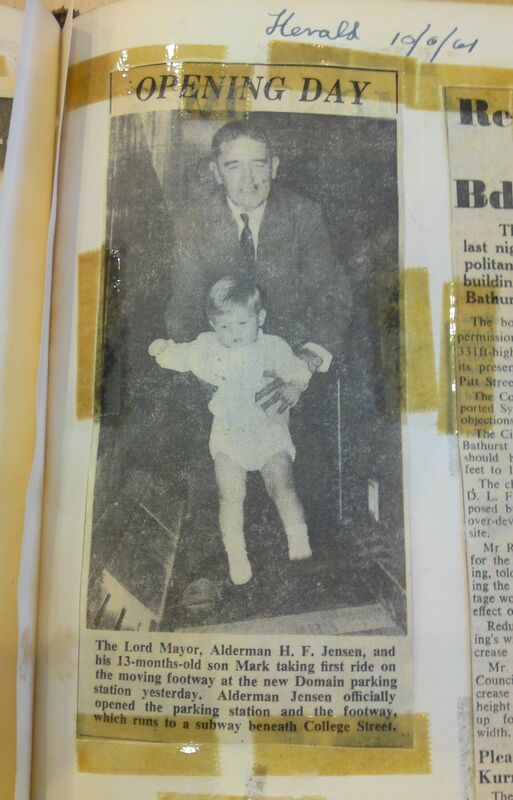 Following his speech and the cutting of a ribbon, the first to ride the footway was Lord Mayor Harry Jensen, with his baby son. After the ride the guests of honour then gathered for a celebratory lunch of Lobster Mornay and salad-filled pineapple shells as hundreds of curious members of the public tried out the footway, eager to experience its novelty. Thousands of people were to follow in the coming week. Parents brought their children in from the suburbs to experience the future. The dark side of the footway was quick to manifest and excitement soon gave way to doubts and fears. There were incidents: a child’s finger crushed, a man’s trousers ripped and the two 5 pound notes in his pocket shredded. Remarks about the footway’s “taste for pedestrians” appeared in newspaper commentary, as well as articles detailing the footway’s newest victims. 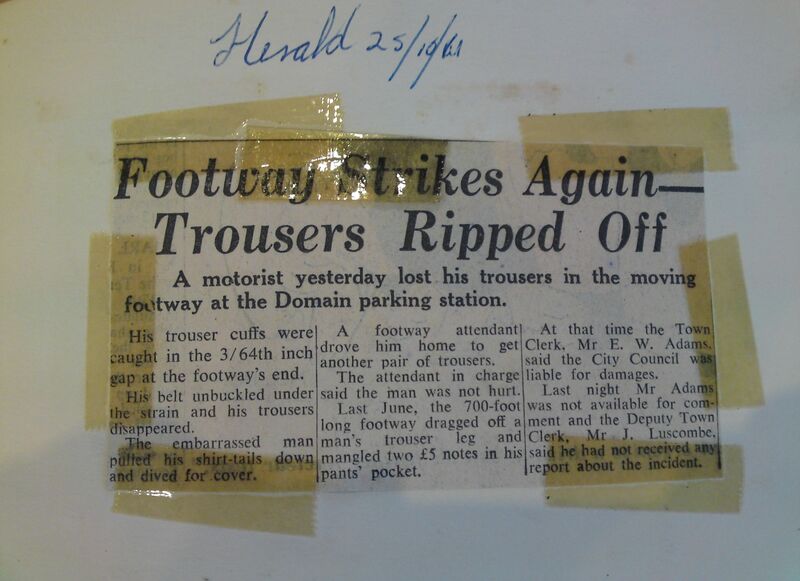 One man had his trousers torn from his body when his trouser cuffs were caught in a gap at the end of the footway; the footway attendant had to drive him home to put on another pair of trousers. A woman lost a galosh. A Pekingese puppy’s hind leg was caught in the gap. This string of incidents led to instructional signs at each end: STEP OFF FOOTWAY – DO NOT SLIDE. 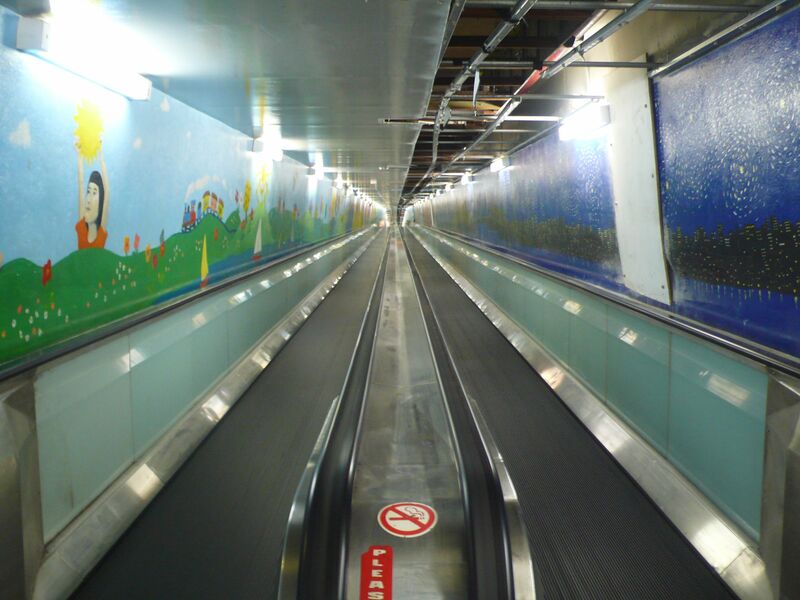 Urban moving walkways were a fairly new phenomena in 1961, although the first moving walkway had debuted in the late 19th century at a World’s Fair in Chicago. A film exists from 1900 of the moving walkway, or trottoir roulant, at the Paris Exposition Universelle. People awkwardly stumble on and off, some tentative, some joyful, some hamming it up for the equal novelty of the motion picture camera. Having never encountered a moving footway before they had to learn how to adjust their bodies to travel on them. The women in hats and gloves and the men in suits pictured in the Sydney newspaper reports of the 1960s seem almost as remote in time as these Parisians at the Exposition. The Domain Footway’s seeming appetite in its first few years can partly be attributed to the public’s adjustment to its unfamiliar technology. The 3/64ths of an inch gap at the end of the footway was a trap for the unaware. Despite plans for cities networked by moving walkways, today they are rarely found outside the bland environments of airports and shopping malls. To encounter them anywhere else is a surprise, especially an example like the Domain Footway, with its loud noise and atmosphere of dingy strangeness. Since its opening day the Domain footway has remained a novelty, a trace of an alternative future city that never came to be. Every time I encounter it I am surprised that it still exists, faithfully running under the Domain, out of sight to anyone but those travelling on it. While in some ways it is anachronistic, it is hard to locate exactly where in time it fits. It seems more like an element from a speculative fiction. The 1940 science fiction novella, The Roads Must Roll by Robert Heinlein, describes a dystopian future America where moving footways are the main mode of transportation and their smooth running is vital to the country’s economic and social order. When the Chief Engineer’s power is usurped and one of the main footways is stopped, he must go “down inside” the workings of the footways to try and restore control. The “down inside” of Heinlein’s story is one of intense noise, the roar of rotors and whine of rollers in constant movement. On a smaller scale, this is exactly the noise of the Domain Footway. Although the Domain Footway can hardly be seen as essential to the city’s functioning, it did suffer its own mechanical crisis in the early 1990s. By then the original mechanism had worn out and it was uncertain if it could be replaced. The company that had originally manufactured the components was no longer in business, but eventually a replacement came through from a company that designed conveyor systems for mining. Two huge, steel-reinforced rubber bands were manufactured in Holland, and installed as the footway’s surface. 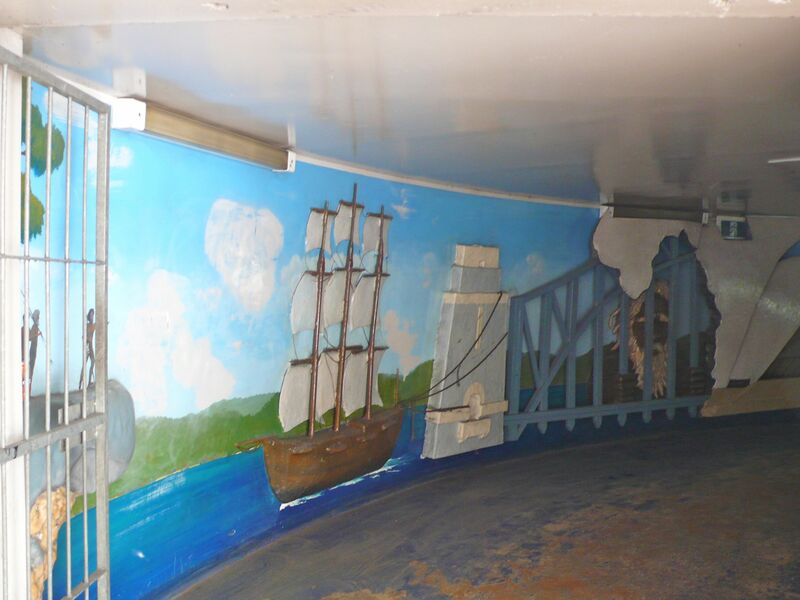 The refurbished footway was decorated by the “Tunnel Vision” mural, painted by mural artist Tim Guider, indigenous artists, and children from Woolloomooloo. Then, after years of stillness, the walkway was again rolling. Other sections of newspaper immortalise the film listings from a time when Leaving Las Vegas and Dead Man Walking played in Sydney cinemas. I register all this as the footway moves me onwards, as I notice each of the people travelling past me on the other side, on their way towards the city. Most people walk, for maximum combined velocity. Every one of them looks away when I meet their eyes. It is not a place where I can imagine talking to strangers, although the footway was in recent times rebranded the “traveldator” for a speed dating event. Couples conversed for the five minute journey, before moving on to their next prospective partner and riding back along the footway together. There is an incline and now I can see the end of the footway and the entrance to the carpark. The leaves in the mural become a string of barbed wire and then an inner city back lane scene. A boy looks down from a window onto a girl in a pink dress who stands, holding a doll, inside a cone of light from either a streetlight or extraterrestrial forces. 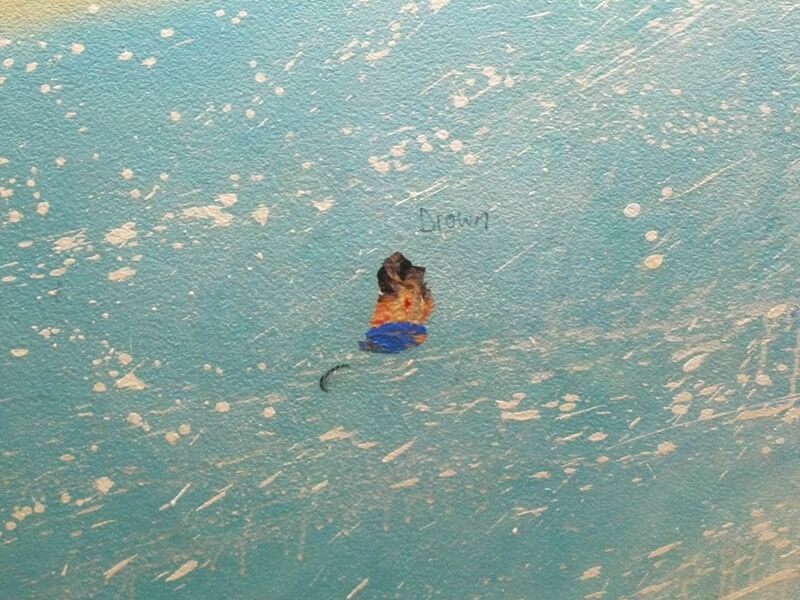 It is a weird, lonely image, made even more eerie by the broken “exit” sign hanging down over it. There is construction work at the end of the footway and the ceiling is a mess of exposed wires. Across from the carpark pay station is a noticeboard with neat, computer generated images of the parking station after its impending refurbishment. Beyond the notice are bays of uniformly grey or white cars, as if they come in no other colours. The majority of footway users are the drivers of these cars and the footway is maintained for their convenience. Joyriders like myself have them to thank for its longevity. 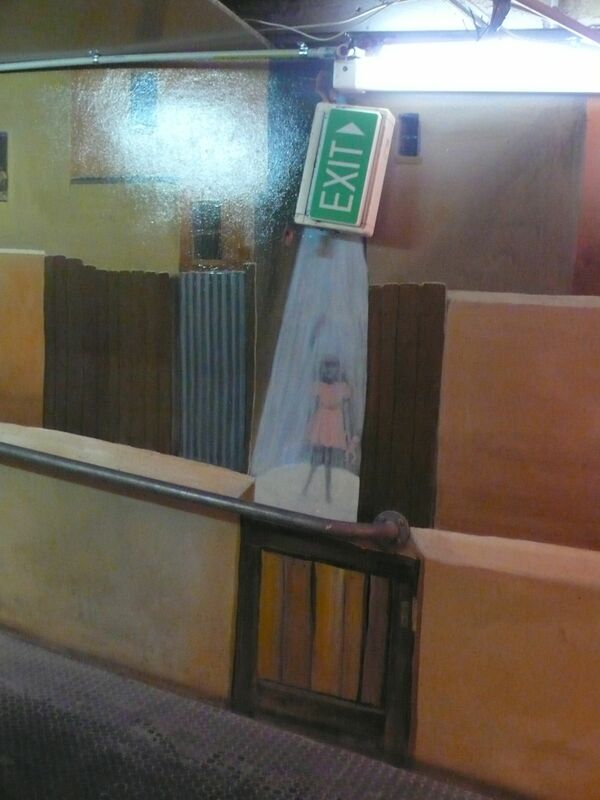 I consider the mural girl in the pink dress, painted inside her blue spotlight at the end of the footway. The image seems obscure until I decide that the light surrounding her is like a spell. Places in the city like the footway form unusual pockets of space and time. While you are under their spell the overall logic of Sydney is inverted and it can be reimagined according to different principles. I feel cast in this different light as I step back onto the footway and let it carry me back towards the city. The newspaper articles are from the City of Sydney Archives. You can view the movie of the 1900 moving footway here. 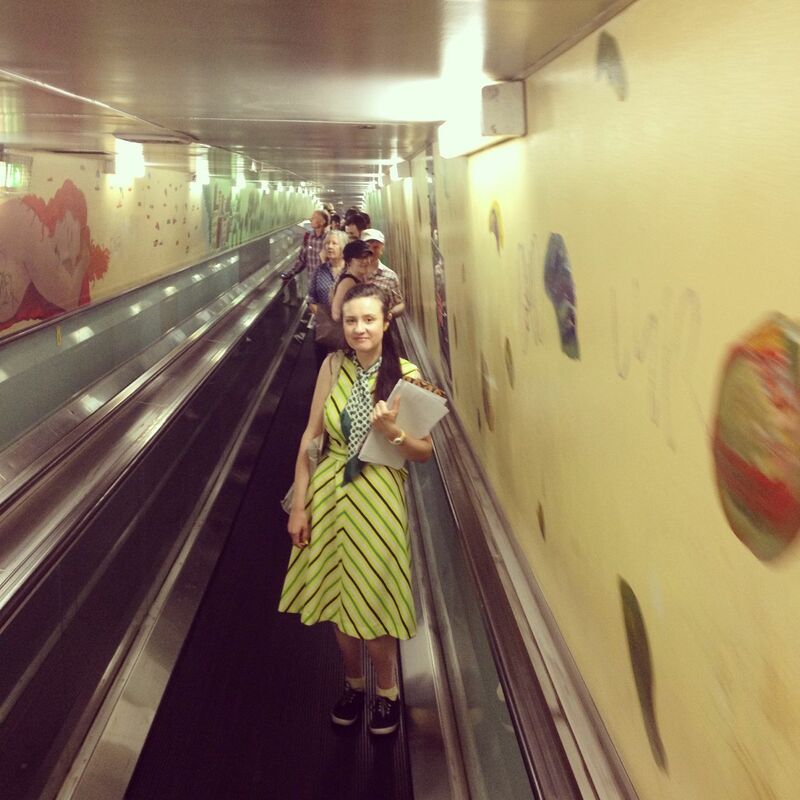 A history of moving walkways. Watch the Traveldator in action in this amateur news story. Roaming Roy, the intrepid Vent Puppet, visits the Domain Walkway.